There are two completely different aspects to a brief but much anticipated midwinter experience I got with America’s most anxiously awaited relaunch, the entirely retooled 2015 Ford Mustang. Part one: Let me say that the new car is unbelievably beautiful and that the new, organic styling does not make it look like a Mustangish Ford Fusion. And that the car’s new, lower, wider stance, its honest-to-goodness independent rear suspension and its vastly updated interior are all magnificent attributes, especially as its GM and Dodge competitors have all considerably upped their games. Part two: The equally talked-about 2.3-liter EcoBoost engine, providing the car with more raw power (310 horses) than the standard 3.7-liter V6, may get the Mustang as much as 32 mpg on the highway, but it makes the car sound like a Jetta. Yes, a Volkswagen Jetta, not a 50-year-old living legend of all that America once was and could be in the automotive universe. Ford is anxious to increase the global reach of its automobiles so a relatively high-mileage turbocharged four-cylinder will be important in new markets from China to Chile, not to mention helping Ford inch closer to the looming federal CAFE standards for overall fleet fuel economy. I have not driven the 5.0-liter V8 version of the 2015 car, but given that it is set to produce 25 mpg on the highway, will offer 435 horsepower and 400 foot-pounds of torque and will most certainly not sound like a Hyundai Elantra wearing a Mustang suit, I would encourage enthusiasts to head in that direction. Even if gas goes back to $6 a gallon. 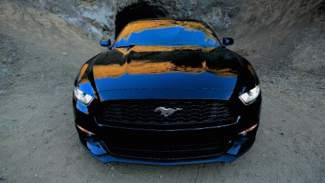 The EcoBoost will still get the car going quickly, even allowing you a bit of wheelspin if you floor it, but the engine noises are never, ever emotional, whatsoever; coupled with the car’s six-speed automatic transmission, I was very much left longing for rumble of any kind. So let’s stick to the 2015 ’Stang’s ample, engine-exclusive positives. The driving experience is indeed radically changed by an all-new rear independent suspension, giving the car a more dynamic feel and certainly providing more resourcefulness when horsepower and a twisting road can meet up in safe and exciting circumstances. Steering input is light and the car’s lower-to-the-ground feel will have you feeling a little more Corvette-like than you’ve ever felt before, especially with the long nose and thankfully thin A-pillars still providing good visibility — 360-degree visibility is actually pretty good, considering the Mustang’s low roof, thanks to a clear shot of rear glass and some flat-bottomed side mirrors. New for 2015, drivers who’d like more out of their car can select three different levels of steering sensitivity, as well as driving modes that range between a no-response snow setting and an absolutely crazy track mode that disables much of the safety electronics (and will have that already light rear end all over the place, should you wish). With the blindingly impactful Triple Yellow Tricoat paint job, my tester’s curves and creases were even more striking, especially the tall phalanges on the top and sides of the hood and the dramatic crease all along the door-handle line. The low, low swept roof line and a new, sharply angled bank of taillights, underneath a trunk with an integrated spoiler, are probably Mustang’s most impressive changes, those six very bright bars of LED tail lamps bookending the prancing pony. Geezers (like me) might consider the seating position crippling but it’s actually quite pleasant and supportive, with perforated leather surfaces, plenty of bright highlight stitching and even full heating and ventilation in the Premium model. The bucket rear seats are, as in the past, mostly meant for kids, as the roof line leaves pretty limited head space. Ford has mixed up the classic and contemporary metaphors with an attractive dash cap and even stitched door panels, deep instrument pots displaying, hilariously, “ground speed,” and a fancy new center stack that integrates the still occasionally cranky SYNC/MyFordTouch touchscreen with elegant aluminum audio control knobs and rocker switches for temperature control. A bank of toggle switches behind one overly phallic shift knob handle the steering feel and driving mode options.